Abstract: Quantum Cascade (QC) lasers are a rapidly evolving mid-infrared, semiconductor laser technology based on intersubband transitions in multiple coupled quantum wells. The lasers’ key strengths are their considerable wavelength tailorability, high power and high-speed operation, and fascinating design potential. We will first give an overview of QC lasers followed by a discussion of several recent highlights, such as the quest for high performance operation and the implementation of unconventional laser schemes. For high-performance, we examine room temperature continuous wave operated QC lasers in the 8 – 10 m wavelength range for both their temperature dependence of the loss and gain as well as their behavior above laser threshold. While the magnitude and behavior of the gain is well understood, the high loss in some laser cavities is still limiting laser performance. In the area of novel QC laser designs, we focus on lasers with heterogeneous cascades, i.e. with different active regions and injectors within one laser. This can be used for multiple-wavelength emission as well as for reducing the voltage defect of the lasers. We furthermore examine the potential for “cascaded” laser emission in QC lasers, demonstrating a dual wavelength (~ 9.6 μm and ~ 8.2 μm) laser with electrons undergoing two consecutive, lasing, optical transitions in each active region. Time permitting, we will briefly show recent results on so-called “left-handed” materials. Semiconductor metamaterials consisting of n+-GaInAs/i-AlInAs heterostructures that support negative index modes in the mid-infrared are reported. We demonstrate negative refraction in these metamaterials for wavelengths from 9-15 μm over a wide range of incidence angles for transverse magnetic polarized light. We will conclude with a short review on the state of the art of QC laser applications, especially in trace gas sensing and an outlook at the challenges and promises ahead in the QC laser fields. This work is supported in part by the NSF, MIRTHE (NSF-ERC), PCCM (NSF-MRSEC), DARPA, and PRISM, Princeton University. 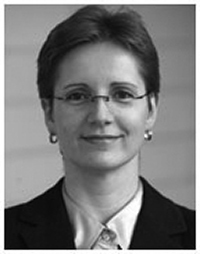 Biography: Claire Gmachl received the Ph.D. degree (sub auspicies praesidentis) in electrical engineering from the Technical University of Vienna, Austria, in 1995. In 1996, she joined Bell Laboratories, Lucent Technologies, Murray Hill, NJ, as Post-Doctoral Member of Technical to work on Quantum Cascade laser devices and microcavity lasers. In March 1998 she became a Member of Technical Staff in the Semiconductor Physics Research Department and a Distinguished Member of Staff in 2002. In September 2003, Dr. Gmachl joined Princeton University as an Associate Professor in the Department of Electrical Engineering and adjunct faculty to PRISM. Prof. Gmachl is the Director of MIRTHE, the newly formed NSF Engineering Research Center on Mid-InfraRed Technologies for Health and the Environment. Prof. Gmachl has authored and co-authored more than 160 publications, has given more than 100 presentations at conferences and seminars, and holds 26 patents. She is an Associate Editor for Optics Express, a member of the IEEE/LEOS Board of Governors, and a CLEO/QELS 2008 program co-chair. Dr. Gmachl is a 2005 MacArthur Fellow. She has won various awards and is a member of several professional societies.